This vibrant costume is ideal for 1980s/Novelty fancy dress; this outfit includes Dress, Bag and Headband. Make sure you stand out from the crowd at any fancy dress party with this great Rubiks Cube Costume, perfect for any 1980s/Novelty/Comedy occasions. This costume includes Dress, Bag and Headband. The dress is divided in to six different sections, all with a colour representing each square. Green, White, Orange, Blue, Red and Yellow are the predominant colours for this stunning dress; at the bottom of the dress the ‘Rubik’s Cube’ logo is printed. In addition to the dress, this outfit also comes with a cute ‘cube’ inspired bag to store all your essentials. Also included is a headband, again this matches the Rubiks Cube Costume with a soft cube on a black headband! This great Rubiks Cube Costume is perfect for any 1980s/Novelty/Comedy themed fancy dress occasion! 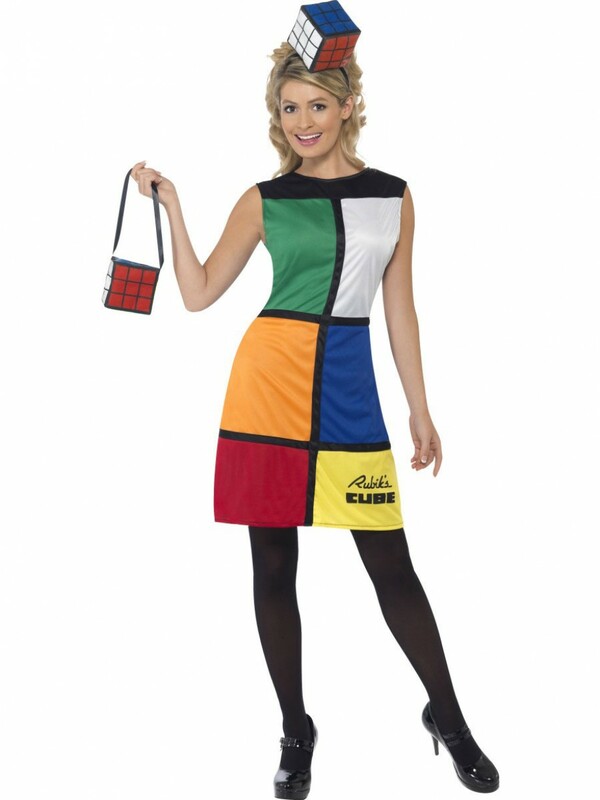 Rubiks Cube Costume including Dress, Bag and Headband.